The addition of a second tree had everything to do with the group text message chain I'm on with my cousins. 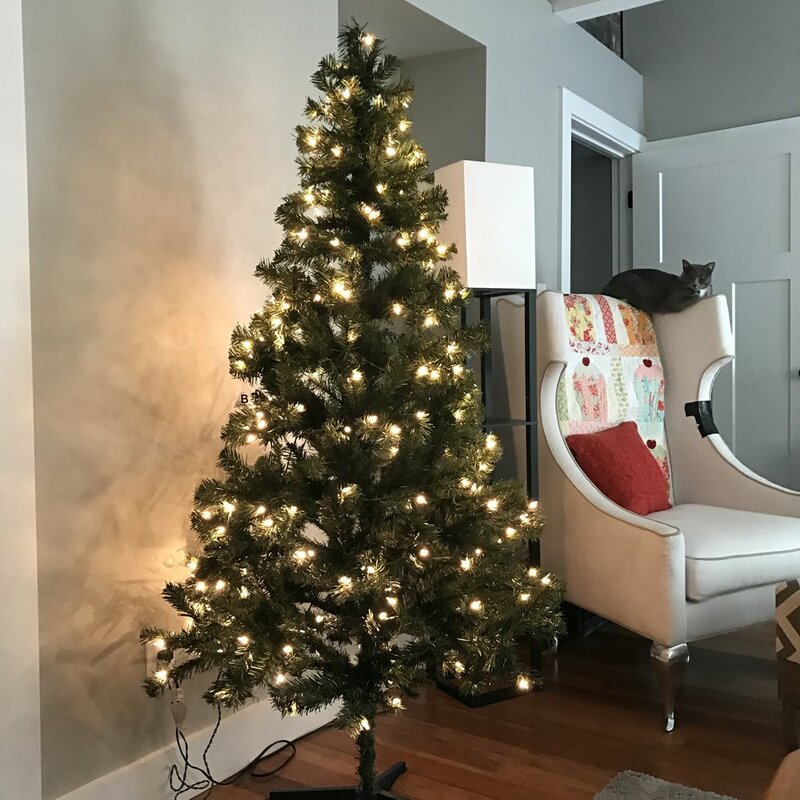 Literally the day after Thanksgiving they were sharing photos of the most ornately decorated homes—Christmas trees in every room, mantles draped in greenery, neatly-hung stockings. I figured I might just up my holiday decorating game, and so I opened the box, stuck together the tree parts, and plugged that bad boy in! 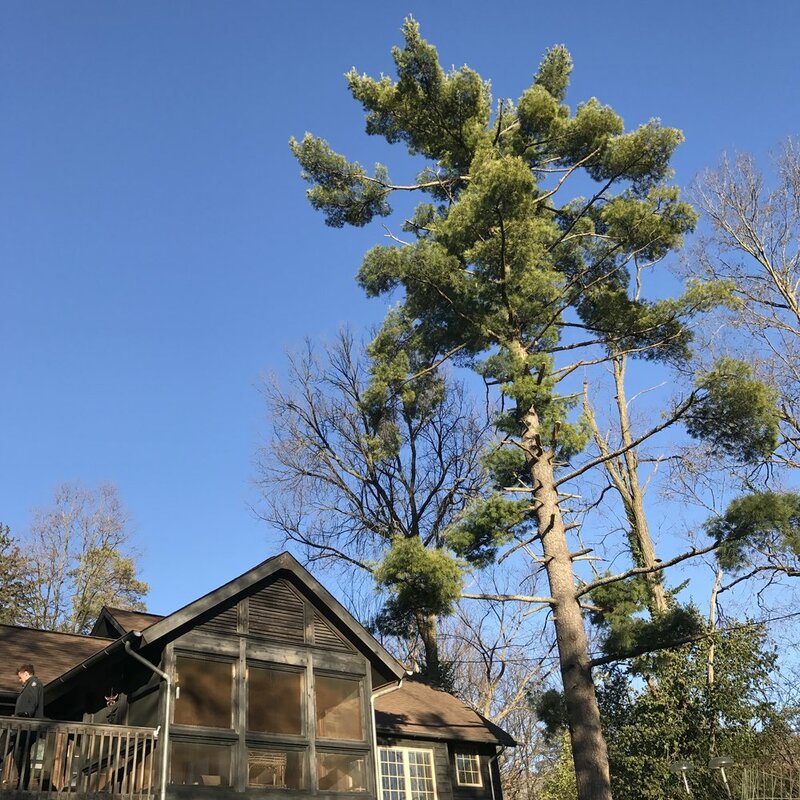 Well, this brings me to explaining that my in-laws live in a charming log cabin surrounded by tall pine trees. 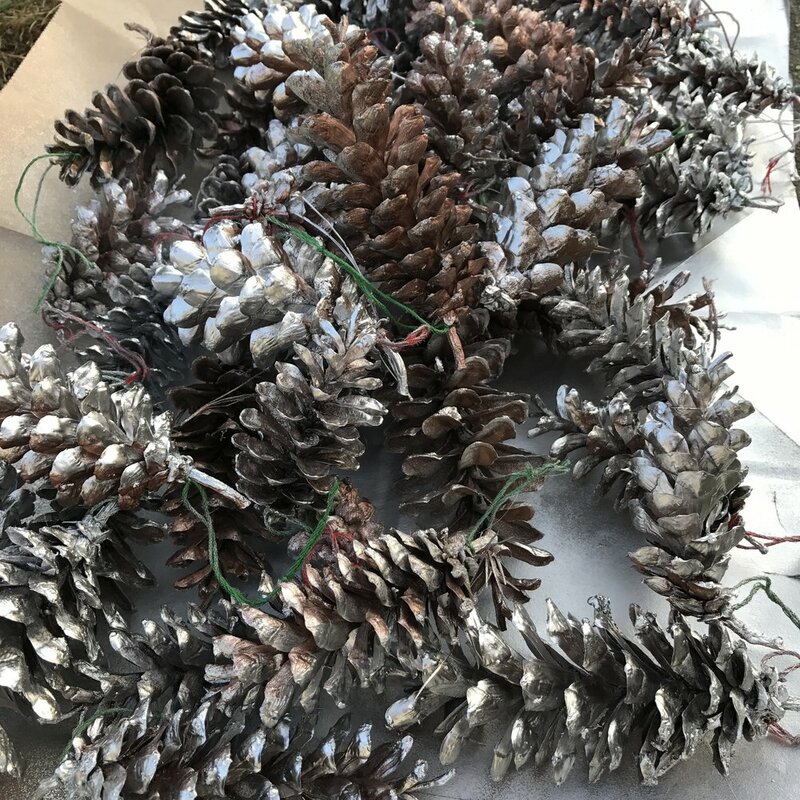 Their yard is littered with pine cones, so when I remembered this week's challenge I figured I might as well make use of these totally free and super wintry supplies! 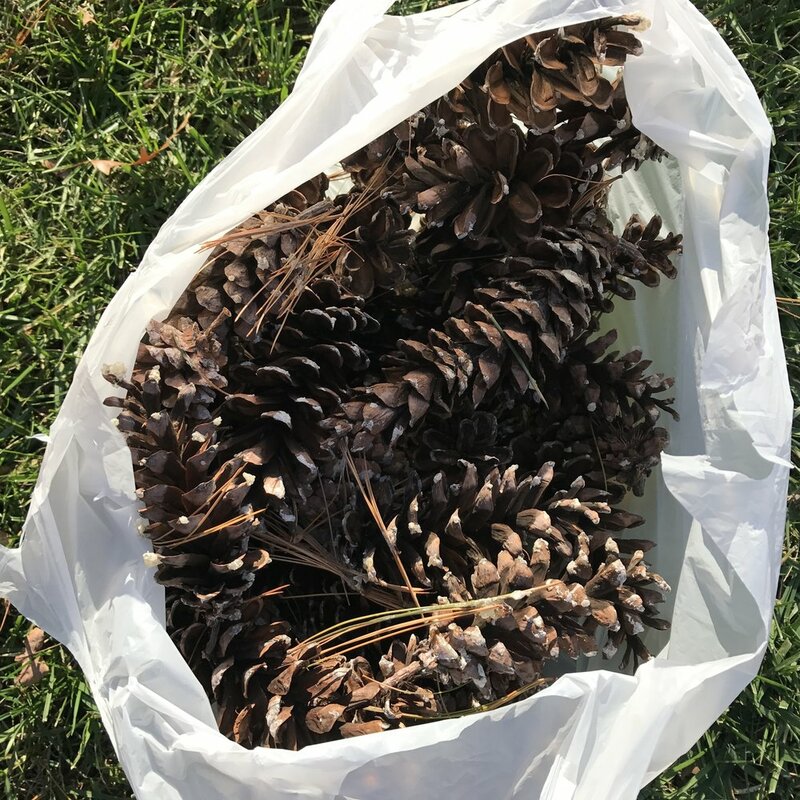 I grabbed a bag and collected 75 pine cones! My idea was that I could then add a string to each one and have instant ornaments! This plan would have been grand, but unfortunately, I seemed to have forgotten about sap. 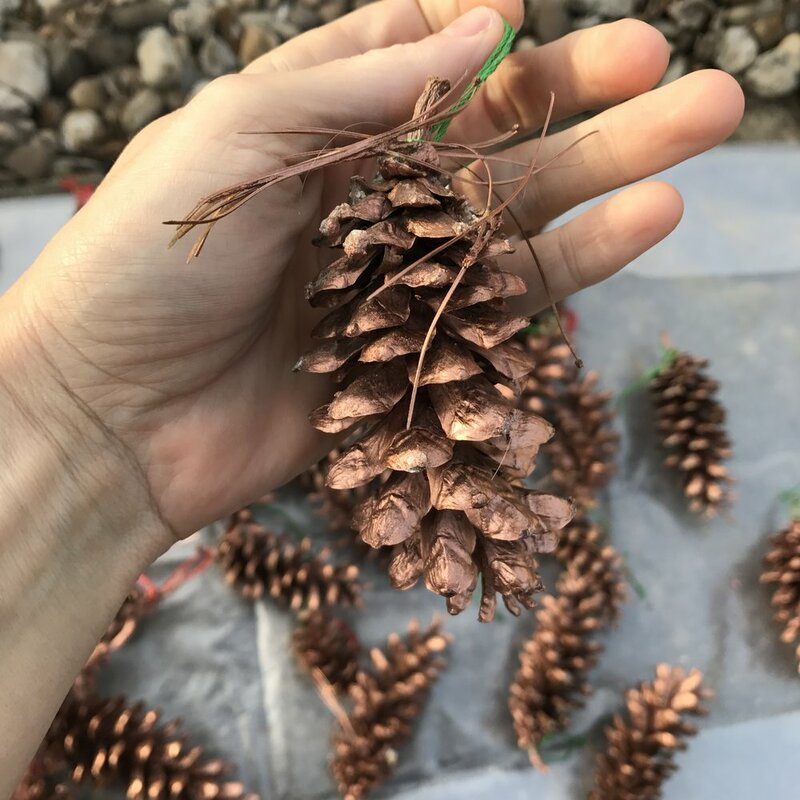 By the time I finished collecting the pine cones, my hands were covered in sticky goo. Spray paint to the rescue!!! 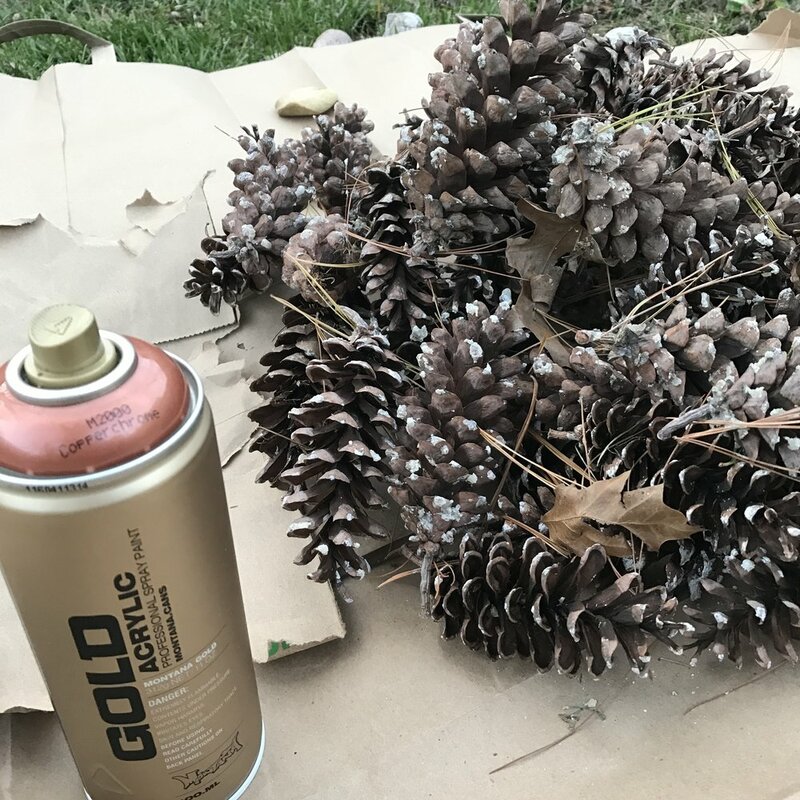 I knew it would seal in the sap, while at the same time making the pine cones extra pretty. I went to the artist supply store near my house to buy artist-grade spray paint. I have a bit of an addiction to this stuff. There are literally a hundred colors to choose from and they beautifully cover whatever you are painting. It’s my secret weapon when I decide to update furniture. Darrick, my husband, helped me decide on bronze. It looks natural and rustic, with a splash of metallic sheen for good measure! Mia, my niece, helped with the spray painting. 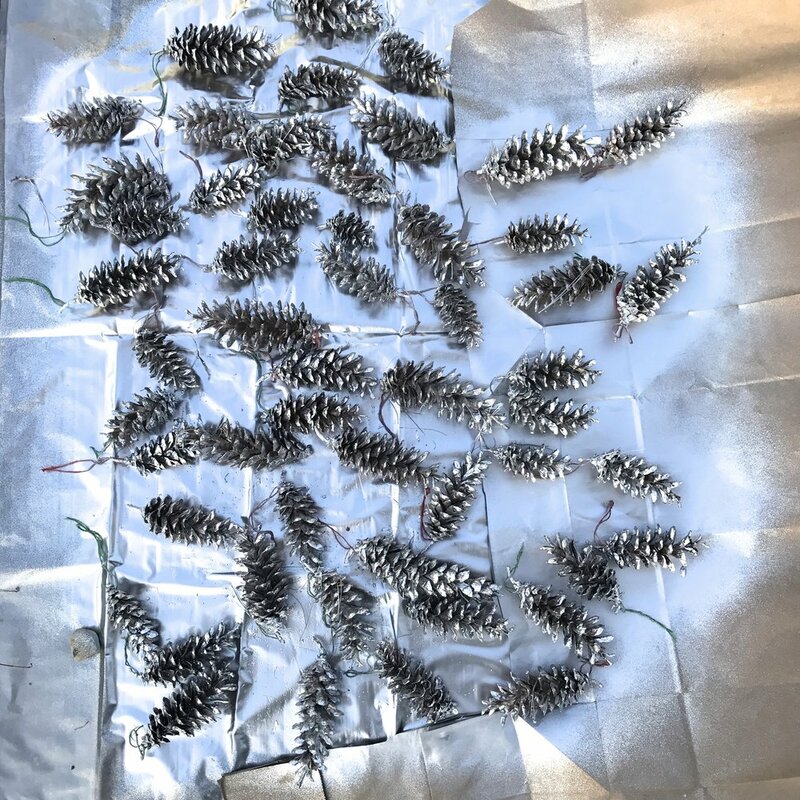 The pine cones were painted on both sides and dry within 20 minutes! This was a GREAT project to do with Mia! Next, I used embroidery thread that I had at home to make the ties for the ornaments—all while I had my hair done! 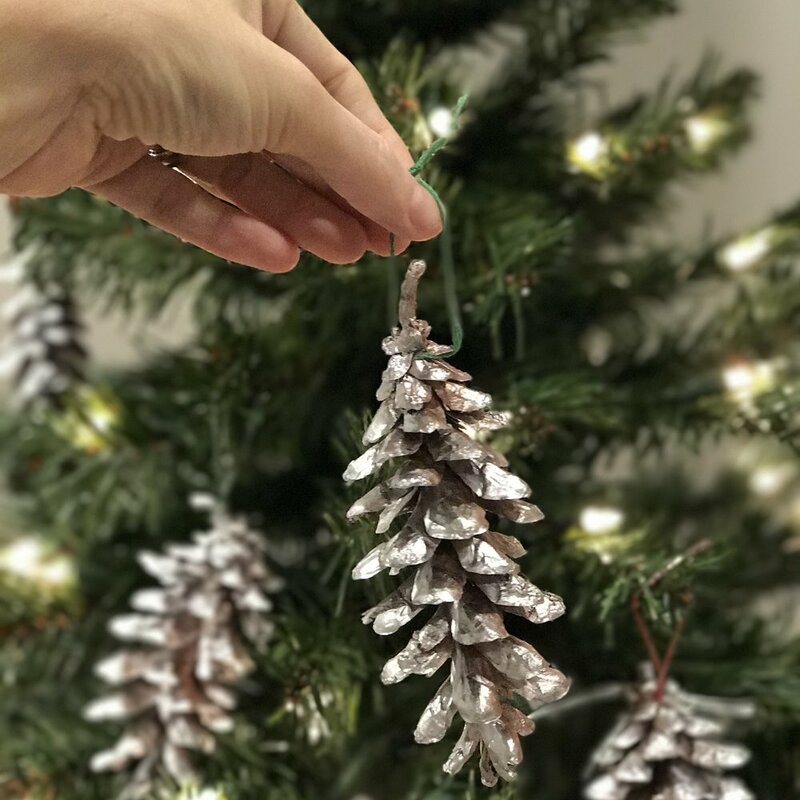 I am constantly "trying to do it all," so those 40 precious minutes of waiting for my color to develop provided the perfect time frame to fit in one of the steps for this easy craft. 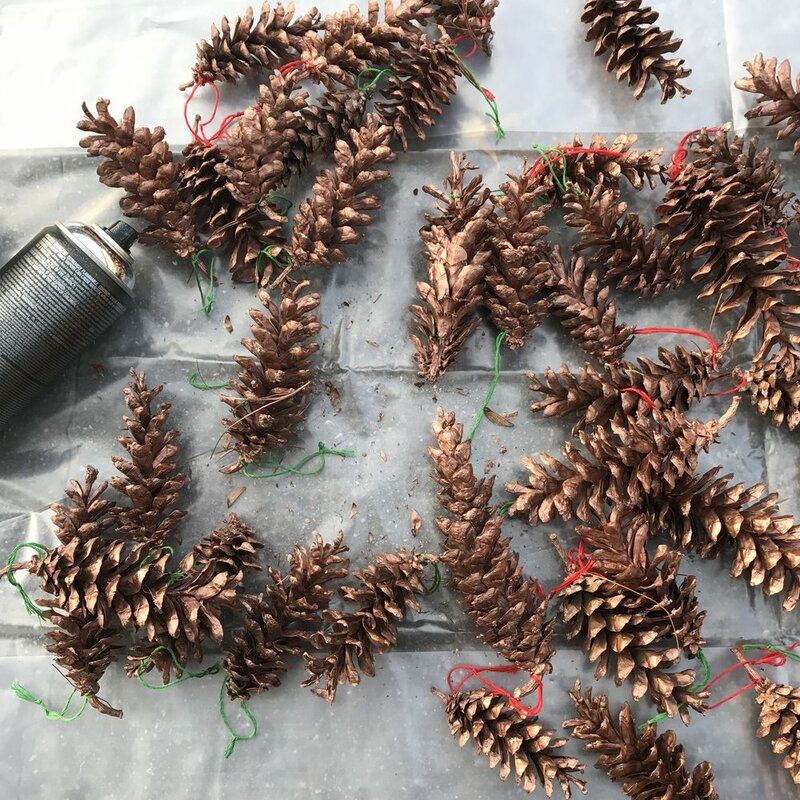 However, even with one coat of paint, the pine cones were still a little sticky. 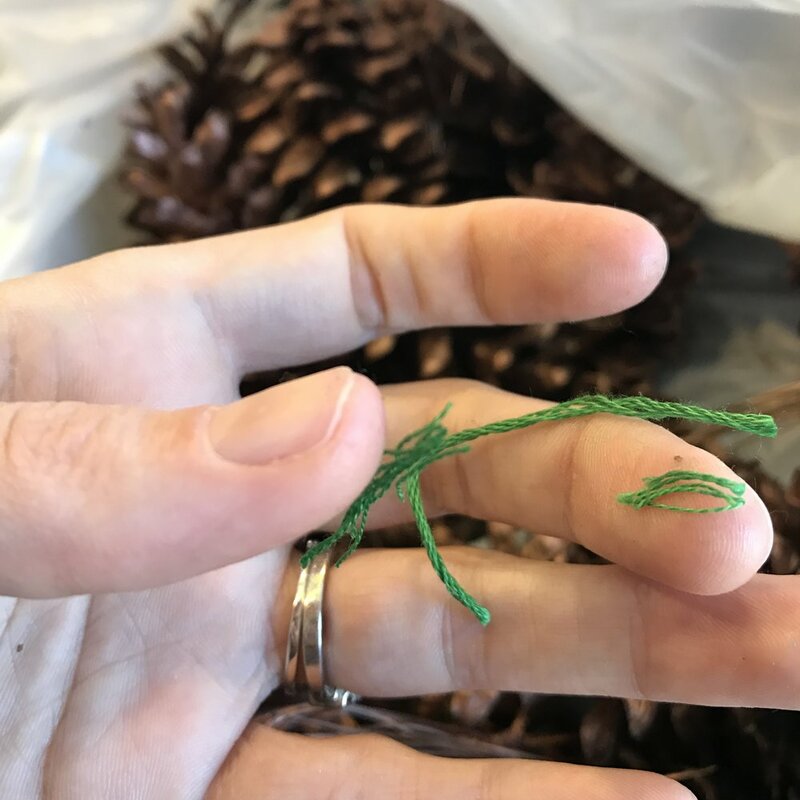 The tiny embroidery thread strands stuck to my fingers, which made the process of adding the ties a tad more frustrating than anticipated. But I did get it all done, and in the end I was rewarded with 75 very inexpensive ornaments! Truthfully, upon further examination, I realize the bronze didn't really show up at all. 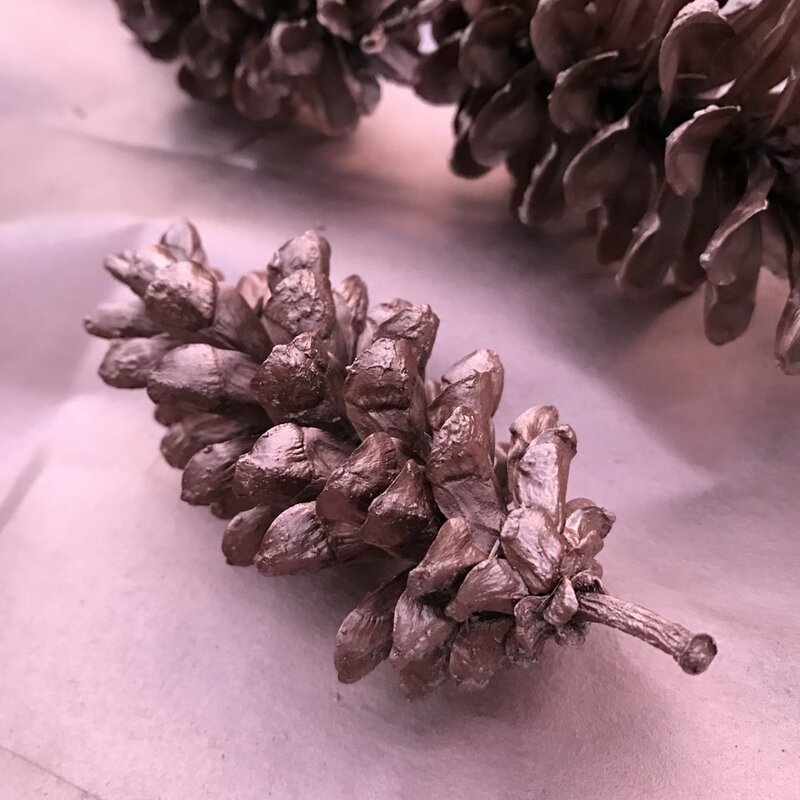 The pine cone ornaments just looked like regular brown pine cones. 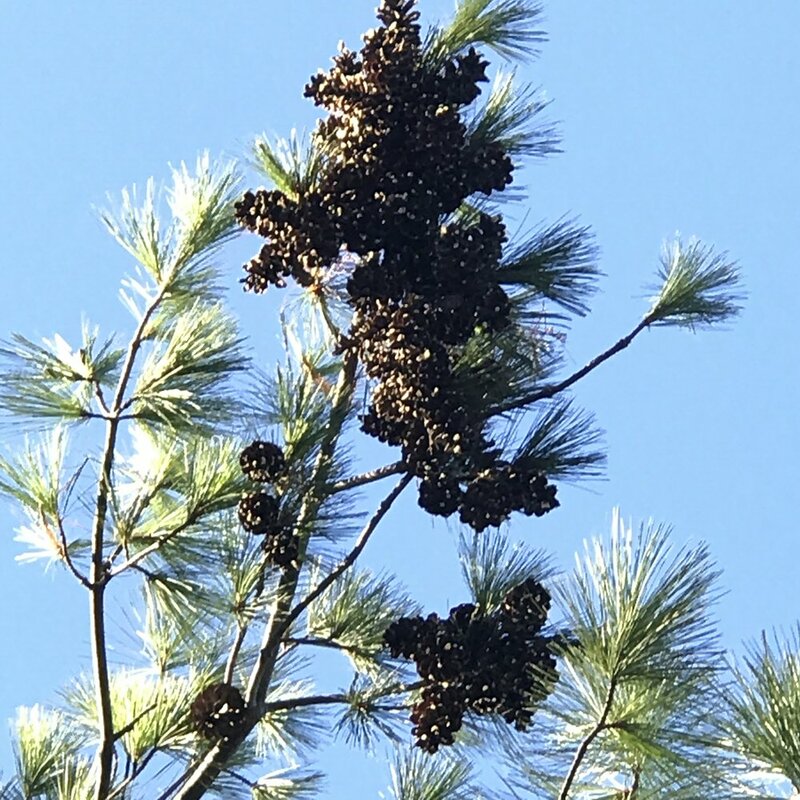 Only this time I didn't cover the pine cones completely. I liked the way the bronze looked against the silver.